What is that, you wonder? Funny you should ask, there’s a tiny interview right here that explains everything in a couple of minutes flat. And Look! Here they are! Super-fast! All the dancers! All the dances! Kind of. the kind of amazing all-music-all-the-time week that passes at such an intensity and with so much incredulous gratitude that it does, predictably enough, seem like a dream. But never fear: we do have material evidence. Seems minimal, and it is, but that’s because the ALBUM is still in the works. The ALBUM, which despite the fact that a year has passed since the raw material was recorded in the Studio at Canterbury Music Co., is still in all-caps in my head because it is still very much an ongoing project. So, ALBUM it shall remain, until it either contracts into an album, or expands, into the LANKA SUITE ALBUM, and becomes a real object in the world, which I can share with you, cher pen-pal-de-mes-rêves. But if, in the meantime, you’d like to know a bit more about it, here’s an interview by Lise Hosein with me about it on Jazz FM 91, that I really like. Ali Berkok and Nick Fraser and Luan Phung and I are playing old and new compositions of mine all over the place this Spring. Raw and wriggling, juicy and delicious, stripped down and naked, compared to the many clothes of all the large-ensemble music I have written before, I’m delectably excited to have these giants for collaborators. Here come all of the limping-dancing feelings. One performance snuck up and happened on April 5 at the Tranzac, but more are coming! May 31! June 19! check the performance calendar! Here’s to staying in touch, oh-pally-oh-penny-pals. The Thing Is will be performing every Sunday in February 2014 at the REX Hotel in Toronto! 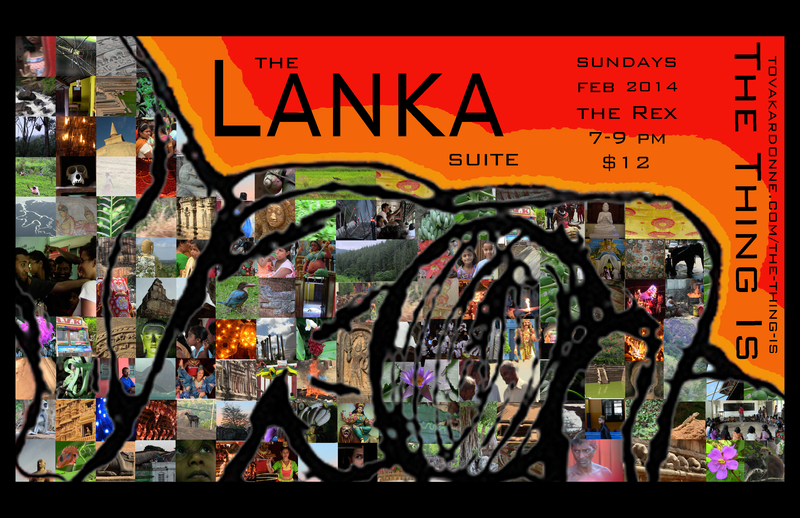 We’ll be premiering a series of new compositions that were inspired by a trip with my partner, Nilan Perera, to Sri Lanka last year– still-evolving works that incarnate the confusion and joy, the alienation and familiarity, the highs and the lows of exploring a society in transition, rebuilding its bonds and institutions after a devastating 30-year civil war.